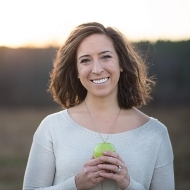 Allison is a Nutritional Therapy Practitioner in Framingham, MA at Wellness Within Holistic Nutrition (http://www.wwhnutrition.com). She works one on one with clients and is also an instructor for the RESTART® real food nutrition program and an instructor for the Feed Your Fertile Body and Feed Your Pregnant Body preconception and pregnancy programs. As a Nutritional Therapist, she believes that health is balanced upon five foundations: Digestion, Blood Sugar Balance, Mineral Balance, Essential Fatty Acids and Hydration. If one (or more) of these foundations are out of balance, our entire health will suffer. No matter what your path to health has been like, she believes our bodies want to be healthy and sometimes they just need some guidance to get them there. Allison takes a holistic approach to wellness and incorporates lifestyle changes along with supplementation to help her clients reach their goals. She believes that within each of us we have the power to take control of our health and it is her mission to help you accomplish this.